The Violet is small and exquisite sleeping cruise in Halong and that's a perfect choice for couple, small family who want enjoy Halong bay in private style. The cruise will take you to where you want & serve you as you need. With just five luxurious cabins, the Violet gives visitors an exclusive look at the wonders of Halong Bay. In this small yet luxurious craft, visitors can appreciate the bay’s massive scale, the boat’s red sails dwarfed by the bay’s towering limestone islands. Safety Radio Comm, Radar, GPS, monitoring camera system, shipwreck alarm system, life jackets, life rafts, tender, first aid kits, fire hydrants, fire extinguishers, smoke detectors in each cabin. The Violet has two special deluxe rooms. We named them Water and Mountain – the key elements of Halong Bay. And they are individually designed. The Water Deluxe has a king bed and a soft white ocean-like ambiance surrounds you in the room. The Mountain comes with a Twin and carries a more yellowish tone. Both cabins are equipped with elegant furnishings and attention-to detail artifacts. They are located on the main deck with 25sqm floor space (5sqm for balcony) and have a private balcony. The bathroom is made of Italian marble with a walk-in shower and a Jacuzzi. The Violet suites read like a romantic fairytale. The four are called Dragon, Phoenix, Moon (double) and Cloud (Twin). As the Deluxe all four come with its single designed 1930 Indochine décor. Large windows give full view to the Bay. While the Phoenix and Dragon come more in reddish hue with golden or silver deco elements and fabrics, the Cloud and the Moon have a more dreamy-white or wistful sky-blue outfit. All of them are pay meticulous attention to detail: plush king solid wood beds, exotic dark furniture, charming fabrics and decorative walls and ceilings paintings to feel like a regal. The suites sit on the upper deck with 38 sqm space including stunning bay views from the private balcony (5sqm). You decide to have breakfast with the rest of the guests. A big spread lays before you. Western cuisine. Asian food. Fusion delights. You get ready for the adventurous day ahead of you. Ah, kayaking. You have thought about kayaking since the day you left your home country. And now, you will soon experience the dash of adventure and the hint of danger that goes with it. And you look forward to returning to Violet. To another sumptuous dinner. To a dip in your Jacuzzi and to a well-deserved massage. As you lay your head on the soft pillow, your thoughts wander to the day after. And you wish this experience never ends. 16.00 Arrive at the Van Gia floating fishing village area. Upon arrival we will transfer by tender to Tien Ong cave. 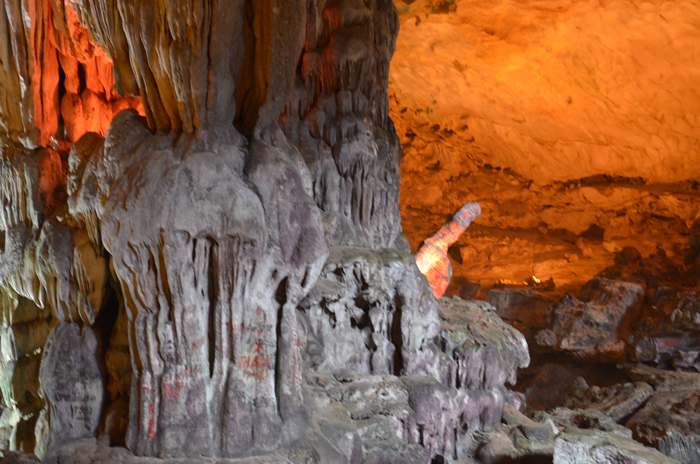 There are many caves in Halong Bay, but Tien Ong is the most recently explored and opened for public access. In 2007 a team of Vietnamese archeologists conducted extensive research which led to the discovery of human bones and artifacts dating to 10,000 – 8,000 BC. The cave has a wide, but short entrance which is said to resemble the shape of a frog’s mouth. The cave is 5 meters above sea level and is 50 meters deep and covers 1000 square meters, almost evenly split into two chambers. We will tour the cave for about 15 minutes. From the cave we will re-board the tender and make the short trip to the Van Gia Fishing Village. There are two options for exploring the village. One option is to transfer on small bamboo boats rowed by the local people. The second option is to travel by kayak (self-rowed). The kayaking option is $15 per person. Cooking class in the late afternoon. At 07:30pm another delicious meal - dinner is served. Early morning with complimentary tea, coffee and pastries are served in the restaurant. You also enjoy a taichi class on the sundeck. Enjoy early morning swimming – in the Bay. By tender boat we bring the guests to a natural white sandy stretch of a beach with crystal clear water - Titop island. Sporty ones can climb up to a hill top to have a last view from above over the Halong Bay before we return to the boat and cruise slowly back to habour. During our trundle, a buffet brunch is served on Violet Halong cruise before we arrive at the shore at around 11.00h. The crew will bid you farewell and you disembark with our tender boat to the Tuan Chau Pier. Around 12.00 noon: Arrive in Halong habour. welcome aboard, enjoy welcome drinks & check-in your cabin & begin your Halong package tour. PM: Enjoy delicious lunch while sailing through the Halong Bay, passing through picturesque areas like the Mat Quy and Am islets. Visit Tien Ong Cave. The Cave is huge – about 2.000 sqm – and is peppered with beautiful stalactites and stalagmites, formed out of ancient limestone karsts about 700,000 years ago. The cave is four meters above sea level. This visit will last approximately 20 minutes. Visit Cua Van Fishing Village, the biggest and oldest fishing village in Halong Bay via a pleasant boat ride (a maximum of four persons per boat). You will pass by this ancient village which comprises floating houses and floating schools – simply irresistible. 08.15: Transfer by tender to our day boat, Sunset. Breakfast will be served as the boat sets sail for the Surprise cave. 09.30: Arrive at the Surprise cave, the biggest cave in Ha Long Bay with 10,000 square meters, when you visit the cave like our Vietnamese house with three chambers as lobby, dining room and bedroom with most beautiful stalagmites and stalactites. We will tour the cave for about 60 minutes. 10.30 Set sail for the Luon Cave. Join the kayaking excursion to the Luon cave and surrounding waters. Kayaking duration is about 4 5 minutes. There will also be time for relaxing on board with beautiful scenery. During our trundle, a buffet brunch is served on Violet boat before we arrive at the shore at around 11.00h. The crew will bid you farewell and you disembark with our tender boat to the Tuan Chau Pier. luggage during disembarkation. Please settle your bill at the bar before 10.30 on this morning.